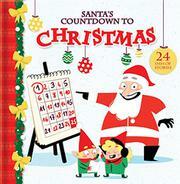 In this Canadian import, Santa and his helpers prepare for Christmas with 24 stories keyed to each day of December leading up to the holiday. Each double-page spread includes a golden ornament with the day’s date, a full-page illustration, and a one-page story about Santa, Mrs. Claus, and the elves. The characters at the North Pole are white, with the elf crew including both males and females and one senior elf with gray hair. A pre-Christmas visit from Santa includes children of different ethnicities. Throughout the month, the elves prep the sleigh, make toys, put Santa on an exercise program, and nurse Rudolph through a bout of the flu. Santa is an old-fashioned, outspoken fellow who supervises and gives directions, with lots of jolly expressions like “Jumpin’ jingle bells!” and “Cracklin’ candy canes!” The 24 stories are entertaining, with such humorous touches as the elves adding GPS to the sleigh and inventing an overly enthusiastic Supersonic Gift-Wrapping Chicken. Cartoon-style illustrations use a flattened perspective, neon-bright colors, and comical touches like oversized, red glasses on Mrs. Claus. The cover illustration and the first story include a calendar page for December with European-style numerals 1 and 7 that will need explanation to most U.S. children.